INTRODUCTION: Responsible self-medication plays a vital role in appropriate use of nonprescription drugs which will improve safety and reduces unwanted effects of drugs. AIM: This study is designed to assess knowledge, attitude, and practice (KAP) toward responsible self-medication among pharmacy students. 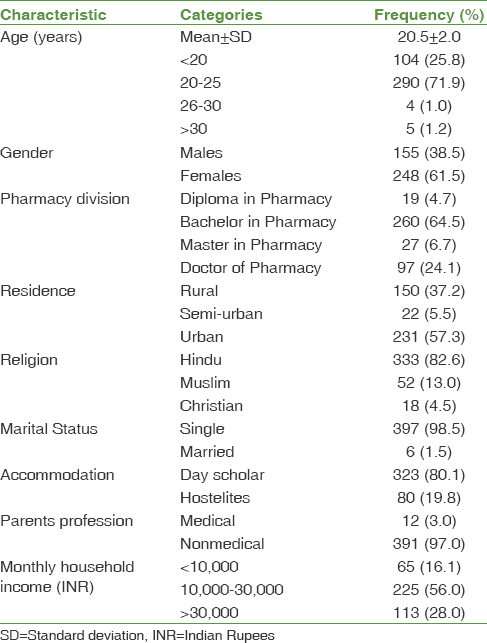 SETTINGS AND DESIGN: A cross-sectional survey was conducted in pharmacy students of various colleges located in Anantapur district, Andhra Pradesh, India. MATERIALS AND METHODS: A total of 403 pharmacy students were enrolled and subjected for interview using prevalidated KAP questionnaire on responsible self-medication. STATISTICAL ANALYSIS: Descriptive statistics were used to represent the sociodemographic characteristics and KAP levels. Association of socio-demographic variables with KAP levels are determined using the Chi-square test. RESULTS AND DISCUSSION: A total of 403 pharmacy students are recruited in the study, in these 19 (4.7%) diploma in pharmacy, 260 (64.5%) bachelor in pharmacy, 27 (6.7%) master in pharmacy, and 97 (24.1%) are doctor of pharmacy. Among 403 respondents, 150 (37.2%) good knowledge, 397 (98.5%) positive attitude, and 170 (42.2%) practice toward responsible self-medication. Respondent's age, pharmacy division, residence, and their parents' profession were significantly associated with good knowledge and rational practice toward responsible self-medication with a P < 0.05. CONCLUSION: The study concludes that pharmacy students are shown more positive attitude toward responsible self-medication. However, students are lack of knowledge and practice of responsible self-medication. Self-medication is a component of self-care, which involves the selection and use of medicines by individuals to treat self-recognized illnesses or symptoms. Medicines available for self-medication is often called nonprescription or over the counter drugs (OTC) which are available without prescription in pharmacies. In developing countries like India not only OTC drugs, even prescription only medicines (POM) are also easily accessible without prescriptions in pharmacy outlets. Self-medication with OTC drugs following knowledge regarding the indication of drug, dosage, possible side effects, interactions, precautions, warnings, duration of use and when to seek professional advice will be called as responsible self-medication. Self-medication also involves obtaining medicines without prescriptions, reusing old prescriptions to buy medicines, sharing medicines with friends, relatives or others, consuming leftover medicines stored at home, fail to comply with prescribed recommendations either prolonging it or interrupting it too early or decreasing or increasing the originally prescribed dose. These practices make irrational use of medicines which promotes unwanted effects such as adverse drug reactions, the resistance of pathogens, wastage of resources, and increased morbidity. The pattern of self-medication vary among the different population and are influenced by various characteristics such as age, gender, income, self-care orientation, educational level, medical knowledge, previous experience, satisfaction, and seriousness of illnesses. The academic curriculum of pharmacy students will fetch a thorough understanding of drugs and their effects, but there was a lack of understanding of disease diagnosis. This knowledge regarding medicines uses among pharmacy student community will drive higher self-medication practices, comparing to other medical and nonmedical students. Individuals, especially youth, are really influenced by the technology, and they can get information about any drug and as well as they can buy drugs through websites, these results in irrational self-medication practice. The study aims to assess the knowledge, attitude, and practice (KAP) of responsible self-medication among pharmacy students of various colleges in Anantapur district, Andhra Pradesh, India. This is a cross-sectional study, which was conducted in four pharmacy colleges; Raghavendra Institute of Pharmaceutical Education and Research (RIPER), Balaji College of Pharmacy, Sri Krishnadevaraya University College of Pharmaceutical Sciences, and JNTUA-Oil Technological and Pharmaceutical Research Institute which are located in Anantapur district. The study was carried over a period of 1 year from October 2016 to September 2017. A due permission was sought from all institution authorities before initiation of the study. The study was approved by RIPER Institutional Review Board with a registration number of RIPER/IRB/2016/PP031. Students studying diploma, bachelor, and master in the pharmacy and doctor of pharmacy were included in this study. The first year of diploma, bachelor in pharmacy and doctor of pharmacy students were not considered for enrollment in the study due to lack of core pharmacy subjects knowledge. Students who are not willing to participate were excluded from this study. The sample size was calculated by Epi Info 7 Dos version 3.5.1 software (Centers for Disease Control and Prevention, Clifton Road, Atlanta, USA) with the assumption of 50% of students have the optimal knowledge, 95% confidence interval and 5% precision, which was calculated as 384. The final sample size with 5% nonresponse rate was 403. According to criteria of this study, a total of 2400 eligible students are available from all the pharmacy colleges' located in Anantapur district. From 2400 sample frame, the desired sample (n = 403) was collected by simple random sampling technique after assigning unique number for each student. A total of 403 randomly selected eligible pharmacy students were given with a prevalidated self-administered questionnaire about responsible self-medication. The questionnaire comprises four parts to gather data regarding sociodemographic characteristics of the study population, KAP toward responsible self-medication. The sociodemographic details included are age, gender, location, level of education, religion, marital status, and family income. The knowledge regarding self-medication was assessed using a 16-point scale. There were 17 knowledge related multiple choice, closed and open-ended questions that carried 16 correct answers. Each correct answer was given a point of 1 and a wrong answer a point of 0. The maximum points expected were 16 and minimum of 0. Points to, aware of self-medication definition (1 point), knowledge about drug indication (1 point), knowledge about discontinuation of drug therapy (1 point), knowledge about safe use of antibiotics (1 point), knowledge about illnesses in which self-medication is advisable (1 point), knowledge about drugs preferred for self-medication (1 point), knowledge about dose and dosage schedule of drugs which are preferred for self-medication (1 point), knowledge about self-medication practice among different age groups (1 point), knowledge regarding storage of drugs preferred for self-medication (1 point), knowledge regarding administration of drugs preferred for self-medication (1 point), knowledge regarding side-effects of drugs preferred for self-medication (1 point), knowledge regarding dosage of drugs preferred for self-medication (1 point), knowledge regarding when to seek professional advise during self-medication therapy (1 point), knowledge regarding when to favor self-medication (1 point), knowledge regarding sources of information about self-medication (1 point), and knowledge regarding reasons to stop self-medication (1 point). After assessment of knowledge points, original Bloom's cut-off points were used to categorize knowledge levels, where 80%–100% correct responses comprise a score of (13–16) meant a good knowledge, 60%–79% correct responses comprise a score of (10–12) meant a moderate knowledge and <60% correct responses comprise a score of (9 or <9) meant a poor knowledge toward responsible self-medication. The attitude was assessed by putting eight statements regarding responsible self-medication practice on Likert's scale, the statement on Likert's scale has positive and negative responses that ranged from strongly agree 5, agree 4, neither agree or nor disagree 3, disagree 2, and strongly disagree 1. The maximum score expected from all statements are 40 and minimum of 8. If the persons scored above or equal to 20, will be considered as a positive attitude and <20 considered as a negative attitude toward responsible self-medication practice. Practice toward responsible self-medication was assessed using five closed-ended questions. If the patient says “no” to all questions will be considered having rational responsible self-medication practice. If the patient says at least one question “yes,” will be considered having irrational self-medication practice. Epi Info-7 statistical software was used to analyze collected data from all study participants. Descriptive statistics such as mean, standard deviation, frequency, and proportion were used to represent the sociodemographic characteristics and KAP of the study population. Association of sociodemographic variables with KAP levels is determined using Chi-square test. P < 0.05 was considered as statistically significant. A total of 403 pharmacy students are responded to self-medication questionnaire, in these most 290 (71.9%) of the students were between 20 and 25 years of age. The mean age of students was 20.5 (±2) and more than half of the students are females 248 (61.5%). Most of the responded pharmacy students are pursuing bachelor in pharmacy 260 (64.5) and doctor of pharmacy 97 (24.1). Majority of the participants were from urban residency 231 (57.3), Hindu religion 333 (82.6%), single marital status 397 (98.5), and day scholars 323 (80.1). Most of the students' parents 391 (97%) were belonging to the nonmedical profession and having a family income of 10,000–30,000 INR 225 (56) as displayed in [Table 1]. Among 403 respondents 332 (82.4%) were given a correct definition for responsible self-medication, majority 325 (80.6%) of them were said that basic knowledge about drug action is required for self-medication. More than half of the students are aware of when to start, continue, and discontinuation of drugs favored for self-medication. The majority 348 (86.3%) of the students are aware of illnesses in which self-medication is advisable. Most of the students are aware of drugs 234 (58.1%), storage 250 (62.0), and in which age group 293 (72.7%) self-medication was mostly chosen. Very less number 59 (14.6%) of students are having knowledge regarding trade name, generic name, dosage, and course of drugs ideal for self-medication. Majority of them were use informational resources such as consulting pharmacist 156 (38.7%), consulting physician 116 (28.8%), previous experience 98 (24.3%), previous prescriptions 87 (21.6%), books/newspapers 57 (14.1%), package inserts 15 (3.7%), and internet/social media 13 (3.2%) for self-medication practice. The common reasons for self-medication among pharmacy students are quick relief 172 (42.4%), no need to consult a physician for minor illness 151 (37.5%), emergency 123 (30.5%), time-saving 108 (26.8%), economical 108 (26.8%), and to avoid the crowd in hospital 87 (21.6%). The most common reasons for not opting self-medication are risk of adverse drug reaction 201 (50.0%), wrong dose 136 (33.7%), wrong drug 136 (33.7%), missing diagnosis 87 (21.6%), and drug dependence 60 (14.9%) as depicted in [Table 2]. 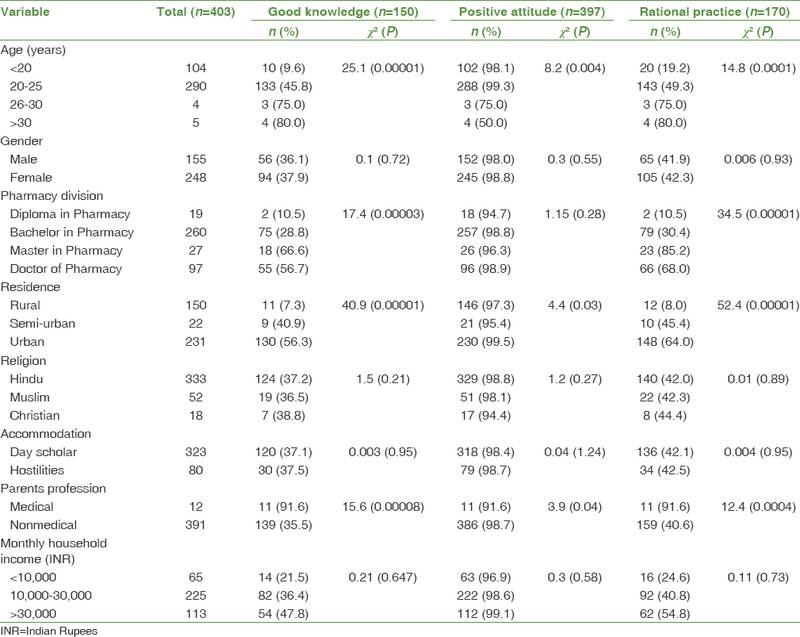 Among all respondents, most of the respondents are given “strongly agree” and “agree” about various statements of responsible self-medication as shown in [Table 3]. 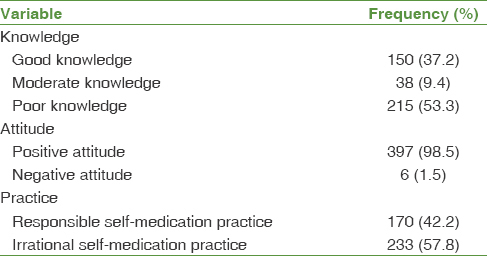 Majority of the students are shown responsible self-medication practice as shown in [Table 4]. Among all respondents, 150 (37.2%) have good knowledge, 38 (9.4%) moderate knowledge, and 215 (53.3%) poor knowledge. Maximum 397 (98.5%) have a positive attitude toward responsible self-medication. 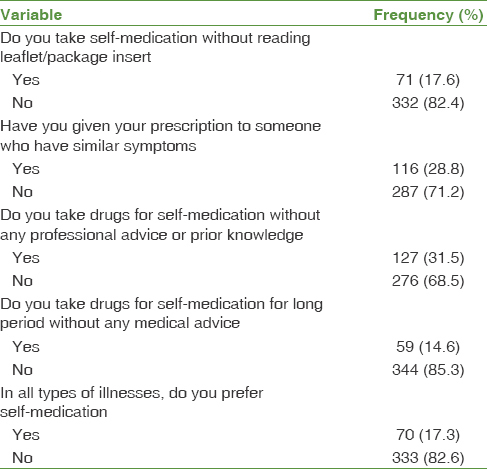 More than half of the respondents 233 (57.8%) are irrational self-medication practice as shown in [Table 5]. Association of sociodemographic characteristics toward KAP of responsible self-medication was shown in [Table 6]. Self-medication is the practice, where individuals treat their ailments and illnesses with drugs which are approved and available without prescription, and which are safe and effective when used as per direction. However, it will lead to unwanted effects if inappropriately used. Self-medication is a widely privileging problem, especially among health-care students. Hence, KAP toward responsible self-medication among pharmacy students is very important to promote health and to reduce drug-related problems. Most of the studies are performed in relation to assess self-medication behavior and practice, but this is the chief study which focuses on responsible self-medication among pharmacy students. The study shows that 332 (82.38%) of the students are aware about responsible self-medication. In this study body pains, headache, cold and cough, fever, diarrhea, vomiting, gastritis, and menstrual cramps are most common types of illnesses where students will prefer self-medication. The similar type illnesses are also reported in the previous study conducted by Sawalha among Palestinian medical and nonmedical university students. However, students should consider that if these illnesses or symptoms occur repeatedly or prolonged period, better to consult physician, because this may be manifestation of serious illnesses. Most of the students are having knowledge regarding drugs such as nonsteroidal anti-inflammatory drugs 224 (55.6%), antihistamines 212 (52.6%), cough suppressants 198 (49.1%), antispasmodics 185 (45.9%), antibiotics 231 (57.3%), and antacids 198 (49.1%) will be considered for self-medication, similar findings are also observed in the study conducted by Verma et al. among professional students in North India. Even though every medication used in self-care needs responsibility, the high rate of antibiotic use in self-medication needs special emphasis. Antibiotic should be administered with a prescription of registered medical practitioner, but in most of the countries, it is available as OTC medicine. This practice poses great risks such as antibiotic resistance. There is a need to educate students regarding antibiotic use and their risk toward microbial resistance. Self-medication will be a good option if benefits outweigh the risks on use of medicines. There is a need to work out upon rational usage of antibiotics by various government and nongovernmental organizations to reduce the risk of antibiotic resistance. Most of the students gain knowledge by consulting physician (38.7%) and pharmacist (28.8%), some of the students are using knowledge about self-medication from previous experience and previous prescriptions, this information may lead to irrational self-medication practice. In this study, the major reasons for self-medications include quick relief (42.4%) and no need to visit doctor for minor illness (37.5%). This may be due to pharmacy students have better knowledge about drugs, so have less predisposition to seek physicians help to treat their illness. The same findings are also mirrored in the study conducted by Bollu et al., among pharmacy students in Guntur. Most of the students are getting self-medication information by consulting pharmacist. There is a necessity to train all community pharmacists about responding to minor illnesses and avoiding nonprescription sale of prescription only drugs. The study shows that 98.5% of the students shown positive attitude toward responsible self-medication, but more than half of the students are shown poor knowledge and irrational self-medication practice. These findings will make an evidence to conduct educational training programs about responsible self-medication not only for practicing pharmacists, general public, and also pharmacy students. This will have a great impact over responsible self-medication practice in future. Respondent's age, pharmacy division, residence, and their parents' profession were significantly associated with good knowledge and rational practice toward responsible self-medication with a P < 0.05. The similar findings are also observed in study conducted by Selvaraj et al. and Gandhi et al., Respondent's gender, religion, accommodation, and monthly household income are not associated with KAP toward responsible self-medication. There was an overall positive attitude among pharmacy students toward responsible self-medication. Dissemination of responsible self-medication concept among pharmacy students through seminars, workshops, and other activities is highly recommended to improve knowledge and practice. This will have a positive influence on the rational use of nonprescription (OTC) and POM that brings high safety on medication use. The authors would like to thank all respondents who are involved in this research study. We also thank Dr. Y. Padmanabha Reddy, Principal, RIPER, Anantapur for his support to conduct this study. All the authors are wholeheartedly thankful to the people who are directly or indirectly responsible for the completion of the work. Pereira FS, Bucaretchi F, Stephan C, Cordeiro R. Self-medication in children and adolescents. J Pediatr (Rio J) 2007;83:453-8. Hansen EH, Holstein BE, Due P, Currie CE. International survey of self-reported medicine use among adolescents. Ann Pharmacother 2003;37:361-6. Venkataraman G, Gangadharappa SK, Jacob J, Bhaskar N, Kulkarni SB, Gupta A. Assessment of self-medication practice among students of a dental college of Bangalore city: A cross-sectional study. J Indian Assoc Public Health Dent 2017;15:73-7. McPartland TS, Weaver BA, Lee SK, Koutsky LA. Men's perceptions and knowledge of Human Papilloma Virus (HPV) infection and cervical cancer. J Am Coll Health 2005;53:225-30. Leyva M, Byrd T, Tarwater P. Attitude towards cervical cancer screening: A study of beliefs among women in Mexico. Calif J Health Promot 2006;4:13-24. Gyawali S, Shankar PR, Poudel PP, Saha A. Knowledge, Attitude and Practice of Self-Medication among Basic Science Undergraduate Medical Students in a Medical School in Western Nepal. J Clin Diagn Res 2015;9:FC17-22. Gupta S, Singh M. Self-medication among North Indian first-year undergraduate healthcare students: A questionnaire-based study. Trop J Med Res 2016;19:162-7. Kumar A, Vandan A, Aslami AN. Analgesics Self-Medication and its Association with Sleep Quality among Medical Undergraduates. J Clin Diagn Res 2016;10:FC07-11. Sawalha AF. A descriptive study of self-medication practices among Palestinian medical and nonmedical university students. Res Social Adm Pharm 2008;4:164-72. Verma RK, Mohan L, Pandey M. Evaluation of self-medication among professional students in North India: Proper statutory drug control must be implemented. Asian J Pharm Clin Res 2010;3:60-4. Morgan DJ, Okeke IN, Laxminarayan R, Perencevich EN, Weisenberg S. Non-prescription antimicrobial use worldwide: A systematic review. Lancet Infect Dis 2011;11:692-701. Radyowijati A, Haak H. Improving antibiotic use in low-income countries: An overview of evidence on determinants. Soc Sci Med 2003;57:733-44. Bollu M, Vasanthi B, Chowdary PS, Chaitanya DS, Nirojini PS, Nadendla RR. Prevalance of self-medication among the pharmacy students in Guntur: A questionnaire based study. World J Pharm Pharm Sci 2014;3:810-26. Selvaraj K, Kumar SG, Ramalingam A. Prevalence of self-medication practices and its associated factors in Urban Puducherry, India. Perspect Clin Res 2014;5:32-6. Gandhi S, Gandhi RA, Nayyar AS. Assessment of abuse of self-medication for oral and dental problems among 21-60 year saged populace residing in the rural areas of Belgaum Taluk, Karnataka, India: A questionnaire study. Arch Med Health Sci 2016;4:180-4.